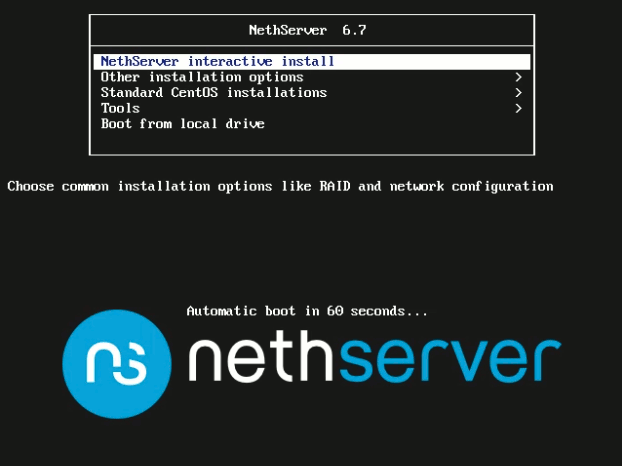 Once you have booted the system from NethServer's installation media, you should be presented with its boot menu. Interactive install: a guided installation where you can select the language, Software RAID, and network settings (and optionally, file-system encryption). Unattended install: an installation without any kind of human intervention: a set of default parameters will be applied to the system. Standard CentOS install: the standard CentOS installation procedure on which NethServer can be installed.